Howard junior guard Charles “CJ” Williams Jr. will declare for the NBA Draft later this week, a source tells HBCU Gameday. The NBA Draft news keeps coming out of Washington DC. 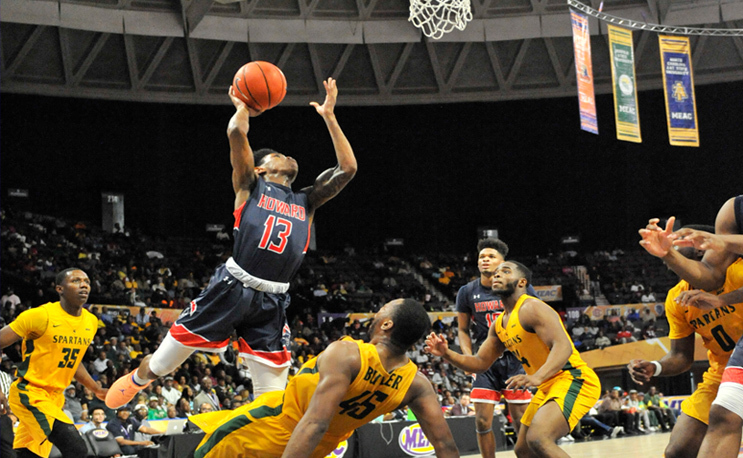 Howard University star guard Charles “CJ” Williams Jr. has decided to declare for the NBA Draft as an early entrant lay, a source tells HBCU Gameday. This news comes on the heels of the announcement that his backcourt mate, RJ Cole, will declare for the NBA Draft as well. As with Cole, Williams will not hire an agent, leaving the door open for him to return to school per NCAA rules. Williams, a 6’6 junior, has been a consistent scorer for the Bison since arriving during the 2015-16 season. He scored 17.9 points per game last season, second in the MEAC to Cole. As a sophomore in 2017 he averaged 20.4 points per game. He’s demonstrated the ability to get to shoot from deep throughout his career. He shot 37.3 percent from the field last season after hitting nearly 41 percent as a sophomore. If Williams and/or Cole return to Howard, they will do so under new leadership. Kevin Nickelberry resigned as coach late last month and the school has yet to name his successor. A source tells HBCU Gameday that former Georgetown coach John Thompson III has interviewed for the position and is the leading candidate. Williams and Cole aren’t the only HBCU stars to declare for the NBA Draft early this spring. Shaw’s Amir Hinton declared for the draft after leading Division II in scoring this past season. No player from the MEAC or an HBCU period has been drafted since Norfolk State’s Kyle O’Quinn was picked in the second round of the 2012 NBA Draft. Hope they do well in the NBA! !